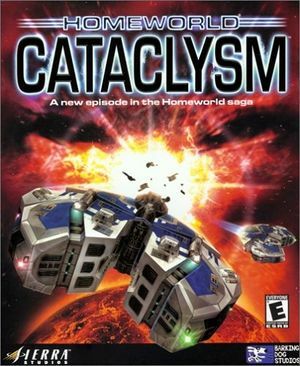 Re-released on GOG.com as Homeworld: Emergence due to "Cataclysm" being a registered trademark of Blizzard Entertainment. Remastered version unlikely due to source code being lost. A full list of all available patches can be found here. Determined by the aspect ratio (see Widescreen resolution). Force from the graphics card control panel (use the OpenGL renderer). Widescreen can be enabled by changing the ScreenHeight and ScreenWidth registry keys in HKEY_LOCAL_MACHINE\Software\Sierra On-Line\Cataclysm. Widescreen mode requires the use of the OpenGL renderer as D3D has rendering errors with widescreen. Enabling OpenGL can be found further down the page in the "Issues Fixed" section. For Windows 10 x64 you need to be run the program as Admin for the registry entries to be created (right click properties on the application under compatibility set run as administrator). Edit the ScreenHeight and ScreenWidth values to match your chosen resolution. If the resolution doesn't take effect after doing the above, try running the game in Administrator mode. Add -window to the game's path. For borderless fullscreen windowed mode add -noBorder as well. If you do not use -noBorder you must run the game at less than maximum screen resolution or it will crash. OpenGL rendering can solve severe lag problems in menus but in order to get OpenGL to work you need NT4 compatibility mode. This is problematic on Windows 8 and Windows 10 because NT4 compatibility mode is no longer offered by default. For Windows 8 and later use the Homeworld hardware acceleration fix to apply NT4 compatibility mode. Download the zip file. Extract the contents and follow the instructions in the readme.txt. Simplest fix is to use the Windows shortcut SHIFT+WINDOWS KEY+ARROW KEY to move the game to the screen of your choice. You may have to alt tab back to the game afterwards. /triple Enables OpenGL triple buffering, improves graphical quality and removes flickering at higher resolutions. Use unless it causes problems. /enable3DNow Enables the 3DNow processor instruction set if available. Use unless it causes problems. /enableSSE Enables the SSE processor instruction set if available. Use unless it causes problems. /disableAVI Disables the intro movies when the game starts. /noglddraw Don't use DirectDraw to setup OpenGL renderers. Try this is you're having problems getting OpenGL to work. /safeGL Don't use possibly buggy optimized features of OpenGL for rendering. Try this if you're having problems getting OpenGL to work.